Over 5000 years of history, India is a vast and diverse country with plenty of fascinating historical monuments and cultural heritage sites which stand quietly today to retell their story of joy, sorrow, courage and sacrifice before the visitors. These marvels consist of palaces, forts, huge imposing monuments, temples and also caves. Ajanta Caves in Aurangabad district is one such monument that stands as an epitome of fabulous cave architecture in India. Attracting millions of tourists each year, Ajanta Caves are one of the most visited heritage sites in India and among the top attractions you must include in Maharashtra Tour Packages. Let us know some interesting facts about Ajanta Caves here. Believed to be existent since pre-Christian era, Ajanta Caves are a group of 30 rock-cut Buddhist cave monuments belongs to era between 2nd century BCE and 650 CE. According to the history scholar Walter M. Spink, the caves of Ajanta were built in two phases. Caves 9, 10, 12, 13 and 15A were built in the first phase during Satavahana dynasty and they belong to Hinayana Sect of Buddhism while the second period of construction was carried out during the rule of Emperor Harisena of the Vakataka dynasty. The site of Ajanta Caves was later abandoned post the end of Harisena’s reign and got covered in thick forest, until 1819 when a British officer rediscovered it. 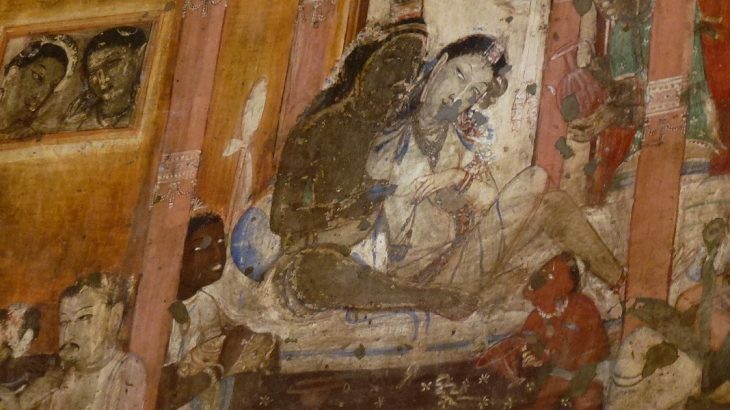 The rock-cut cave monuments of Ajanta Caves comprise marvelous paintings and eye-catching sculptures that are considered to be masterpieces of both “Buddhist religious art” and “universal pictorial art”. Owing to its fine murals, Ajanta – Ellora Caves combine to form UNESCO World Heritage Site in 1983 and is now considered to be one of the most important tourist destinations in the world. It is also a protected monument which is taken care by the Archaeological Survey of India (ASI). With a height of about 76 m, Ajanta Caves are excavated in a horse shoe shaped rock surface overlooking the Waghora stream. There are about 30 caves in total including an unfinished one. Out of these, five caves are chaityagrihas while the rest are viharas. With regard to date and style, the earliest excavations belong to Hinayana sect of Buddhism. Stupas are the object of worship in these caves. The caves have been carved such that they seem to imitate the details of wooden construction. The second phase of cave construction is different from the earlier one in terms of pattern and layout. It involves depiction of Buddha image, both in sculpture and painting. The main theme of paintings in the caves is the illustration of various Jataka stories and events from the life of Buddha. The base surface of the paintings on walls and ceilings consisted of a rough layer of ferruginous earth mixed with rock-grit or sand, vegetable fibres, paddy husk, grass and other fibrous material of organic origin while the surface was finally worked with a thin coat of lime wash. Over the lime washed surface, outlines were drawn boldly and spaces were filled with essential colors in different shades and tones to achieve the effect of rounded and plastic volumes. The colors and shades used were red and yellow ochre, terra verte, lime, kaolin, gypsum, lamp black and lapis lazuli. The main binding material used in the paintings was glue. The caves at Ajanta is one of the renowned Buddhist monuments in India. These caves are famous for beautiful mural paintings and sculptures that epitomize Buddha and various Jataka tales. 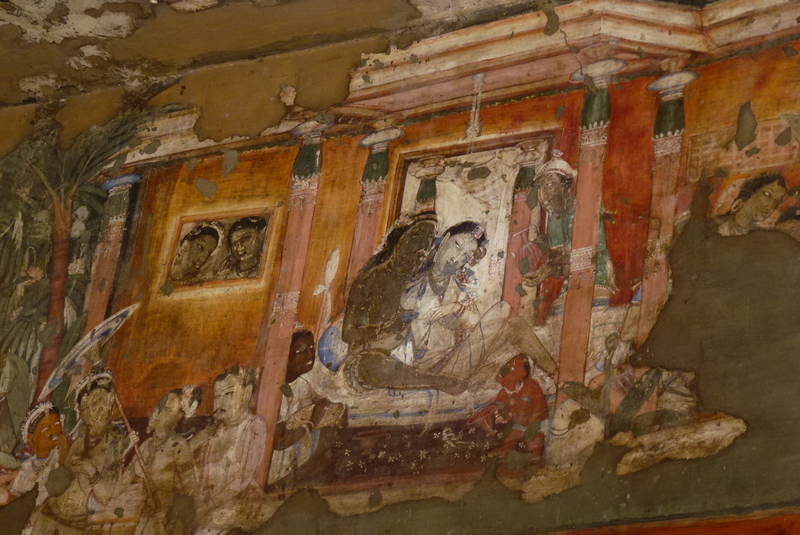 The general style of paintings at Ajanta Caves seems to have influenced paintings in Tibet and Sri Lanka. The world famous paintings at Ajanta Caves also fall into two broad phases. The earliest is noticed in the form of fragmentary specimens in Cave 9 & 10, which are datable to 2nd century BC and the second one could be noticed in the form of exemplary paintings of Vakataka period in Cave 1, 2, 16 and 17. The artwork in the caves comprises well preserved wall paintings of Bodhisattva, Padmapani and Avalokiteshvara. Various incidents from the life of Gautama Buddha and the Jataka Tales are represented and recreated on the walls of these caves. Scenes from the royal court of the respective eras are also painted. The enthralling caves of Ajanta and Ellora in Maharashtra are the epitome of beauty. Representing both Theravada and Mahayana Buddhist traditions, the rock-cut caves have magnificent paintings which are the finest example of impressive Indian artistry that existed in the foregone era. Owing to its beautiful sculptures and paintings, Ajanta Caves attracts millions of domestic and international tourists every year and are considered to be one of the most visited ancient monuments in India. Usually, Ajanta Caves can be visited along with Aurangabad and Ellora Caves as part of Aurangabad Tour Packages. All, Destinations Ajana Caves, Ajanta - Ellora, Ajanta - Ellora Caves. permalink.